Francisca Ramirez, coordinator with the National Council in Defense of Our Lake, Land, and Sovereignty, takes a deep breath. ?“I was born in Fonseca. ?I live in Fonseca. 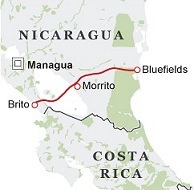 ?I want to die in Fonseca.” ?If the canal partnership between Nicaraguan President Daniel Ortega and Chinese billionaire Wang Jing ?comes to fruition, her future home is uncertain. 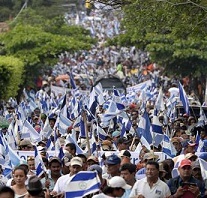 According to Nicaragua’s Supreme Electoral Council (CSE), between 78 and 80 percent of Nicaragua’s 3.3 million eligible voters participated in the November 6th election, re-electing Sandinista President Daniel Ortega with more than 62 percent of the vote and sending a Sandinista majority to the National Assembly.? Since 1880, güirisería, or artisanal mining, has been the main economic activity in the municipalities that make up the so-called mining triangle in the North Atlantic Autonomous Region (RAAN) of Nicaragua. Artisanal gold extraction begins with the gathering of auriferous mineral from abandoned mines, external outcrop, or river sediments. 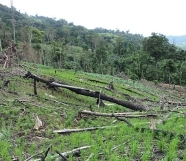 This is done manually, sometimes with the aid of explosives.The current situation in the mining triangle, where industrial mining and güirisería coexist reinforces? high poverty levels and the deterioration of human and environmental health.